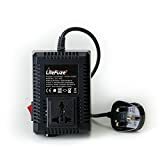 The electrical receptacles used in United Kingdom are type G. You will therefore need a US to type G adapter in order to plug in your appliances. Special considerations - Voltage tolerance of 230 V +10%/-6% (216.2 V to 253 V), widened to 230 V ±10% (207 V to 253 V) in 2008. The system supply voltage remains centered on 240 V.  A "shaver socket" (similar to Type C) is sometimes found in bathrooms that will provide low current to some other plug types. These sometimes have a ~110 V socket and a ~240 V socket in the same unit, or a switch to select voltage for a single socket. The G type socket usually has an on-off switch. 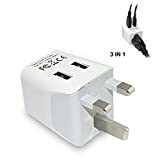 IEC 60309 plugs and connectors are used in industrial and construction locations as well as for outdoor use in domestic and other business premises. Plug types D and M were used until the 1960s and are still in preferred use for theatre and TV stage lighting applications due to lack of internal fuse.